When reigning Olympic champion Nino Schurter crossed the line to win the opening round of the UCI World Cup cross-country series in South Africa this March, there was a significant postscript: he won it on 650b wheels. For some people, the fact that his Scott-Swisspower team had the option of 26in, 29in and 650b-wheeled bikes was an unfair advantage over his competitors. For others, it was a big clue towards the direction the Swiss brand would take in 2013. That the new wheel size would feature on the redesigned Genius trail bike platform and not a new cross-country cruise missile was a surprise, as was the revelation that 26in wheels were out of the window. In fact the new Genius will be available only in 29in (Genius 900) or 650b versions (Genius 700); the unchanged 180mm travel LT platform that we tested in the May issue, however, will still be shod with traditional hoops. Aside from adopting two new wheel sizes — a subject we’ll return to later — the new Genius gets a full chassis revamp for 2013. The whole frame has been reengineered specifically for each wheel size and now much more closely resembles the shorter travel Spark. Gone is the old Equalizer 2 pull-shock, superseded by a conventional push-shock (once again made by DT Swiss) that is both 200g lighter and much easier to set up. You still get three distinct suspension modes with the Nude2 shock; Lockout, Traction and Descend. It’s a lot like Fox’s CTD (Climb, Trail, Descend) system in terms of its goal, but while Fox uses the compression damping to affect suspension feel and geometry, Scott’s system plays with the air spring volume, just as it did on the previous generation Genius. In Descend mode the air chamber is at maximum volume, allowing more sag, longer travel and less ramp up at the end of the stroke. Flick the handlebar-mounted Twinloc lever to Trail mode and one of the air chambers is sealed off, reducing the volume, limiting the travel and providing a snappier, more progressive feel. The final mode locks out the shock completely. By reconfiguring the suspension, the shock now enjoys greater protection from the elements. Scott claims a more advanced, more tuneable and more progressive damping system on the new bike. Set-up with the Nude2 shock is also massively simplified over the old Equalizer; no longer are there two rebound damping dials, and checking sag or maximum travel can now be done at a glance thanks to the exposed shock shaft. 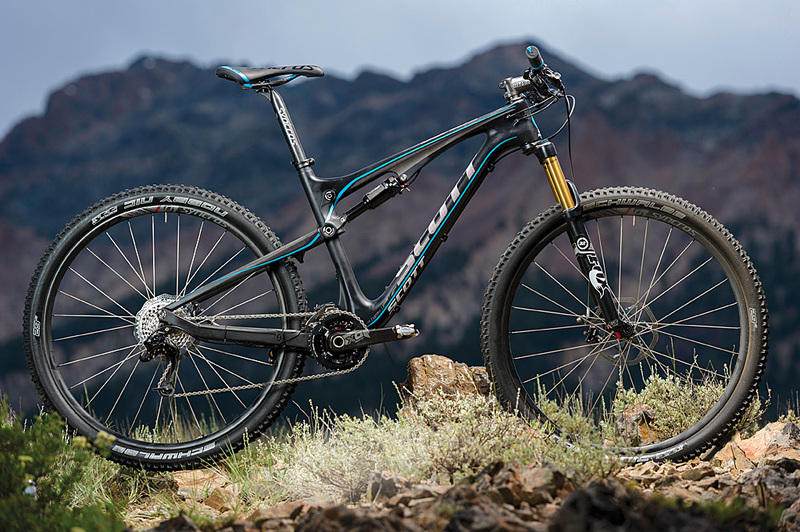 And if you’re not a big fan of all Scott’s bells and whistles, you can always bolt on a 200mm eye-to-eye shock from the likes of Fox or RockShox. Much of the solidity comes from the new bottom bracket moulding, now a huge box-section sculpture integrating the press-fit 92 bottom bracket and main pivot. The head tube is also much stiffer; more rigid than even the Genius LT. Although the Genius gets a top tube-anchored swinglink, just like the shorter travel Spark, the bearings are further outboard to improve stiffness. Integrated into the link is a geometry adjust chip, giving the opportunity to alter the bottom bracket height by 6mm and the head angle by just under half a degree. With both the Genius 900 and 700 coming soon to a showroom near you, the biggest question is which wheel size to go for? To answer, we must first take into account a big difference in suspension travel. The Genius 700 maintains the full 150mm of travel of the old design, but because it’s so much harder to engineer long travel into a 29er and keep a rein on the geometry, the big wheel edition runs 130mm. Increased rollover and reduced angle of attack help make up some of this deficit, but really rough terrain will always favour longer travel. Scott is championing the Genius 700 as the ideal bridge between longer travel suspension and larger wheels. According to its many graphs and diagrams 650b gives you rollover, traction and angle of attack benefits over 26in, with very little in the way of negatives — so no geometry problems, better agility than 29in, and less of a weight penalty. Only the lack of wheel and tyre options, it concedes, is a problem. Despite reassurances from Scott’s many engineers and designers, we remain cautious about 650b. The increase in diameter over 26in (650b is not halfway between 26in and 29in, as the oft-used 27.5in billing suggests) seems too marginal to make it worthwhile. We’re keeping an open mind but we’ll have to wait until we get the chance to ride the Genius 700 and 900 back-to-back before we come to any firm conclusions.